Oracle’s Platform as a Service (PaaS) will now feature artificial intelligence (AI) capabilities. 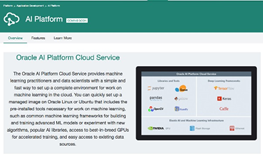 This platform provides fast and easy access to machine learning and data science capabilities from the cloud. As Oracle is embracing Open Source in this AI Cloud it brings together the power of the scientific and data science community and the strength of Oracle with all its integration capabilities. This blog post is the first of a series in which we will look into different aspects of this upcoming Oracle AI Cloud. Although Oracle never provides promise dates, delivery will likely either be linked to a major event, or come as a surprise. Either way, we can already deduce quite a bit about the new offering from the short description on the Oracle PaaS Cloud website. Oracle rightly chose to reuse what is already available in the market with regards to AI and machine learning and combine that with its own strong integration capabilities. This platform delivers the capabilities to extend and improve existing cloud and on-premises applications based on data and usage figures. Three use cases demonstrate these capabilities: Read the complete article here.